Crowdfunding week: time to make a trip for some "Crowdfooding"
With all the crowdfunding and fundraising going on this week for every not-for-profit in the world, with all the appeals that have been filling our many inboxes in hopes of filling our generous hearts, somehow I never saw anything about filling any empty stomachs. That is, until I suddenly heard from the Building Owners and Managers Association of Chicago with their goal to collect 75,000 pounds of food in four weeks for the "food-insecure." According to BOMA, one person out of six in Cook County is food-insecure. That translates into 860,000 individuals in our area who really do not know where their next meal is coming from. The drive ends December 12. Food is being collected at more than 140 BOMA-affilated buildings in the area. South Loopers, there isn't a building that's technically in our immediate neighborhood. But there are two that are close enough--and worth a short walk over with nonperishable food items (i.e., canned fruit, veggies, chili, soup) for the drive. The addresses near the South Loop are 440 S. LaSalle and 311 S. Wacker. Hopefully, a lot of us South Loopers (and others) will be able to drop by to help BOMA meet their generous and lofty goal. 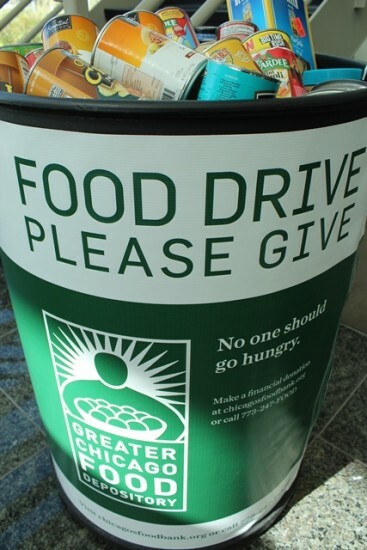 BOMA is partnering with the Greater Chicago Food Depository in their efforts to distribute the food they collect.